Xiaomi MiJia 360° Smart Home Camera new firmware upgrade is here starting with Xiaomi Mi Home Android Application. Download Xiaomi Mi Home Android Application latest version from here. 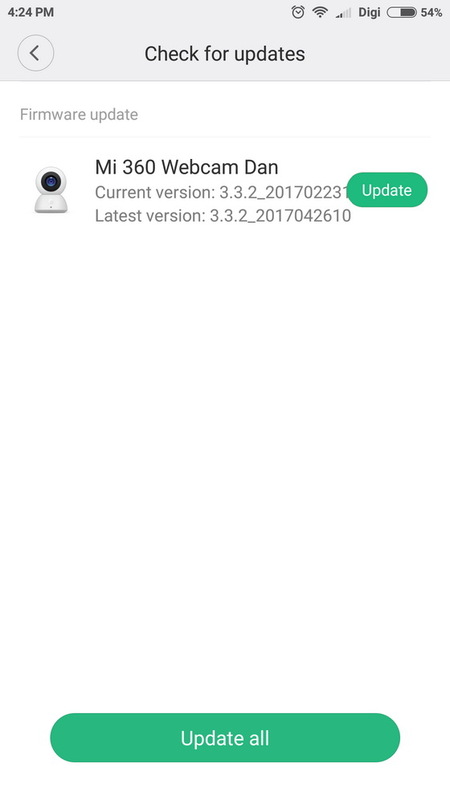 Xiaomi MiJia 360° Smart Home Camera new firmware: 3.3.2_2017042610. Xiaomi MiJia 360° Smart Home Camera previous firmware: 3.3.2_201702231. Xiaomi MiJia Smart Home 360° ІР-camera has a noncantilevered design, which helps you to freely adjust the shooting angle using the Smart Home application. Now you can get a better idea of what is happening on the screen, and all members of your big family will easily fit into a frame together on the video of any event. This miniature camera body has been qualitatively and carefully created by our engineers and designers. You will be delighted with a noncantilevered design of this camera. The camera lens has a high bandwidth, but at the same time it is very reliable and resistant to shocks and scratches. Simple and convenient IP-camera — this is what you need for your comfort and calmness.